A few weeks ago the “Fatman on Batman” Kev Smith inspired me to try my hand at a Batman illustration and I came up with my Batcave seen below. Mr Smith apparently saw my tweet about him and was kind enough to hit me back. In his last podcast he was chatting about Twitter and said he “hit back an artist the other day.” No idea if that was me, but I choose to believe it was! Thanks Fatman! Gave me buzz! I thought I’d follow it up with a Superman image, this time focussing on the environment instead of the character. It’s kind of inspired by Grant Morrison’s All Star Superman. It didn’t turn out exactly how I planned, but it’s still not a bad effort. I like to think it looks like a piece of concept art for the movie that never was. What should I do next? Maybe Billy Batson arriving at the Rock of Eternity for the first time before he becomes Captain Marvel! Shazam! For the last few months I’ve been listening to a lot of podcasts and stumbled across a great one by movie director Kevin Smith. “The Fatman on Batman” is a brilliant listen for people who take their comicbooks seriously and Mr Smith has been able to attract some amazing people who have had a hand in bringing Batman’s world to life. Guest have included everyone from Adam West to Mark Hamill. A lot of people don’t realise that Luke Skywalker’s longest running role has actually been as the Joker in the Batman animated series and the Arkham games. Who knew that the Jedi Master could get so evil? The show inspired me to turn my illustration skills to depicting the Dark Knight himself. 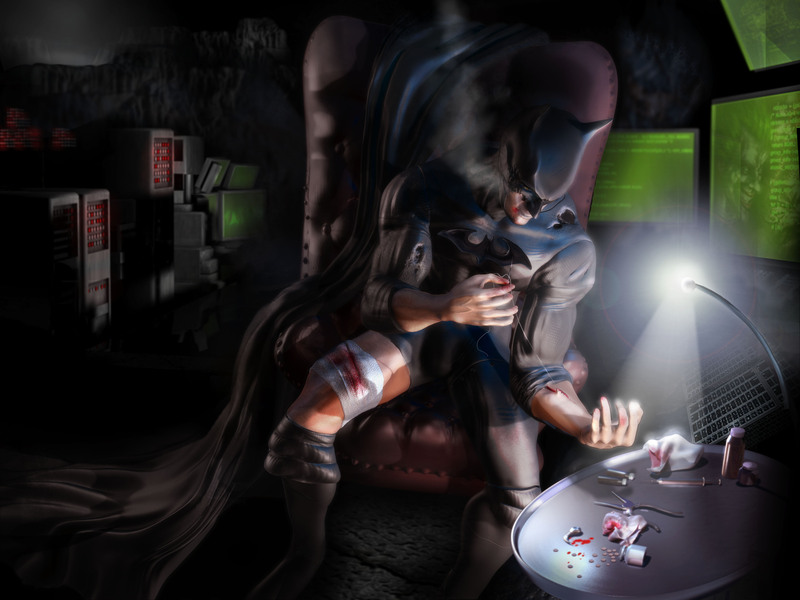 I wanted to show a side of the invincible Batman that we don’t often see. Hurt, battered and patching himself up. The image was made up mostly in Zbrush with compositing and final touches done in Photoshop. Who shall I do next? Spiderman maybe? Superman in the Fortress of Solitude would be challenging. I reckon I could make some pretty great crystal effects with a bit of work. Watch this space to see what I come up with. Many years ago I attended Lancaster university and had by most accounts a pretty awesome time. I went through a phase of joining every society under the sun and paid visits to the Hip Hop society, the Karate club, the Archery club and many more. It was in the Karate club that I met a guy called Mike Grist. God knows Mike was a lot better at Karate than me and I still remember the session where we were partnered up and had to pummel each other in the stomach and the way I groaned after the class. 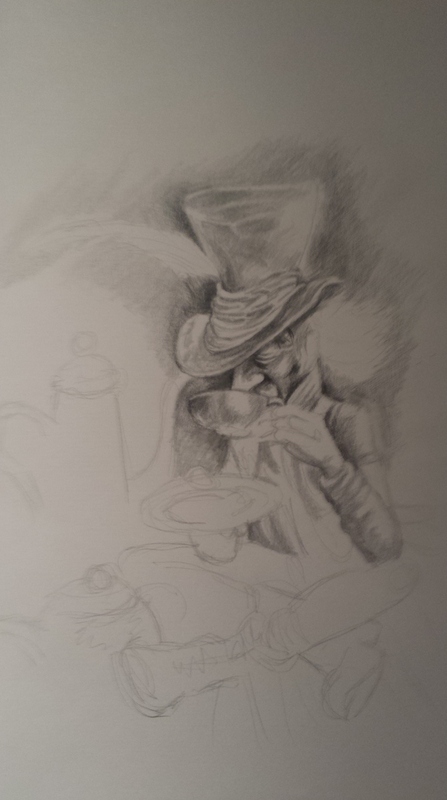 I contacted him last year to see if he would consider me as the supplier of his next book cover. 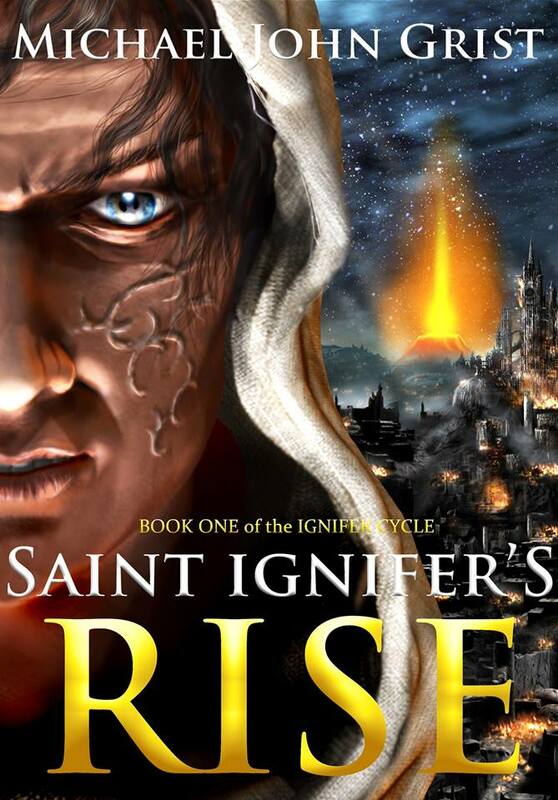 Mike kindly agreed and very soon I was working on the cover for his first fantasy novel “St Ignifer’s Rise”. 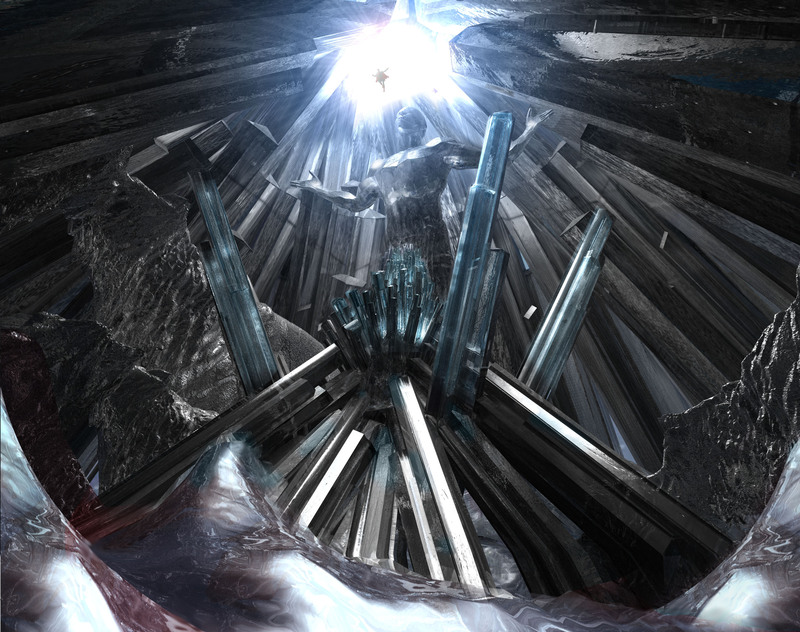 The image is done is my usual mix of 3D and 2D imagery. I’m pretty happy with how it turned out and I’m especially proud of the scars that cover the face of the main character Sen. Zbrush is perfect for that kind of job. The book is finally on release and is available for purchase through amazon. 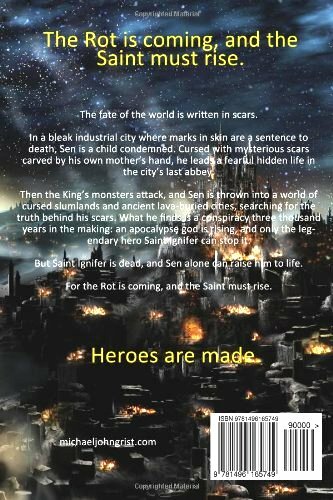 Check out Mike’s site for some pretty great book reviews, ruins articles and other bits and bobs. And pick up a copy of his book on amazon.co.uk! Being a digital artist is pretty great, but in one area it’s annoying. Not to be too mercenary, but one of the most lucrative parts of being an artist is the sale of originals. And when all your work is created in a digital space then best you can hope for is a limited edition print. But somehow even that doesn’t have the same feel as an original where you can see all the brushstrokes and imagine how the artist once stood before that very canvas just as you’re standing there now. So I decided to find out if I still have the artistic chops to make something without the help of Photoshop, Zbrush or Painter. Just plain paper, pencils and an eraser. 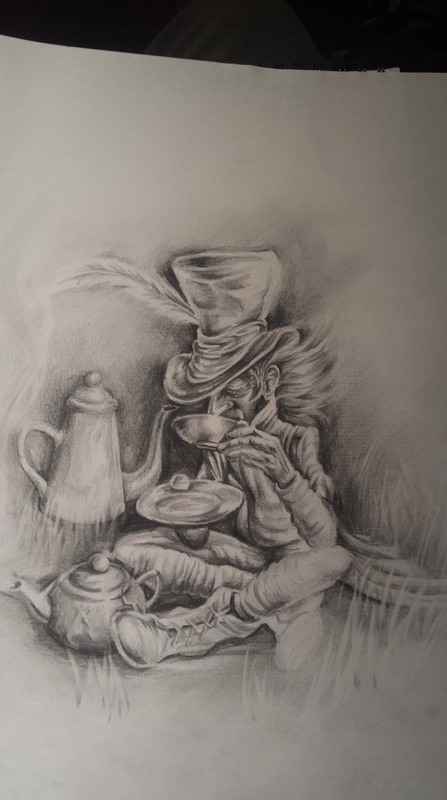 I thought I’d use one of my own digital images as a springboard and kind of do a retroactive original of my Mad Hatter picture. Ok, not too bad for a first attempt. 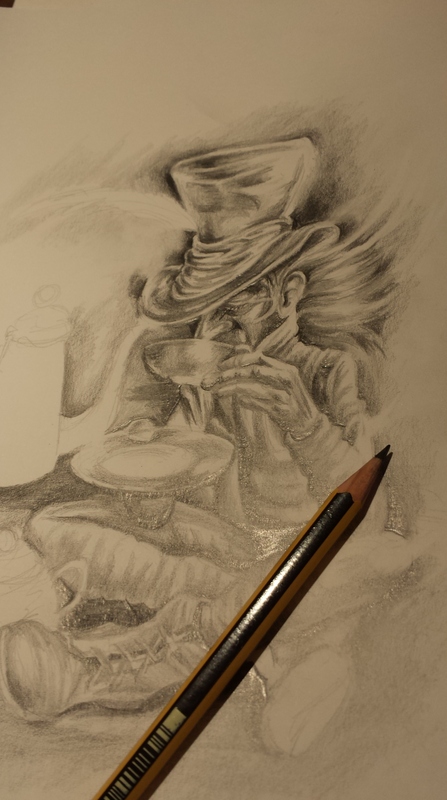 I haven’t touched a pencil in about 4 years, so I’m fairly happy. I’ll keep at it and see if I can resurrect the old skills. 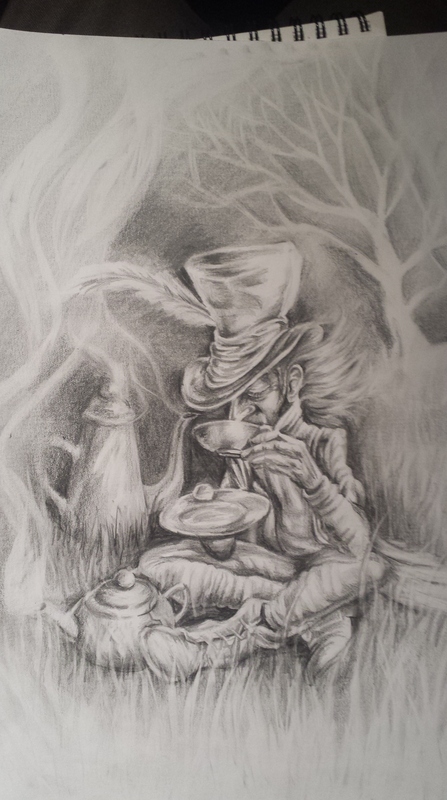 So you never know, you might be able to pick up one of my originals some time soon. This one is destined for the States, going to my friend Suzanne. She made me a wooly hat recently, so it’s only fair that she gets the Hatter! Don’t forget to check out my work on my other sites! Being an illustrator with a bit of photoshop skill can be fun when it comes to dealing with kids. My nephew Rafferty is starting to really use his imagination in his games so when we took a trip to Newborough woods in Anglesey I saw the chance for a bit of fun. I’d recently heard about a guy who took his star wars mad kids to a huge forrest and convinced them that the ewoks really lived there. He soon had them sneaking around hunting for ewoks and running away when they got too close, taking photos the whole time. Of course he then simply had to photoshop a bunch of ewoks into the photos and they had hard proof of their adventure. So why couldn’t we have a similar adventure? Rafferty just happens to be a big fan of the Gruffalo, and we even saw a rare red squirrel as soon as we arrived, as though inviting us to start the story. 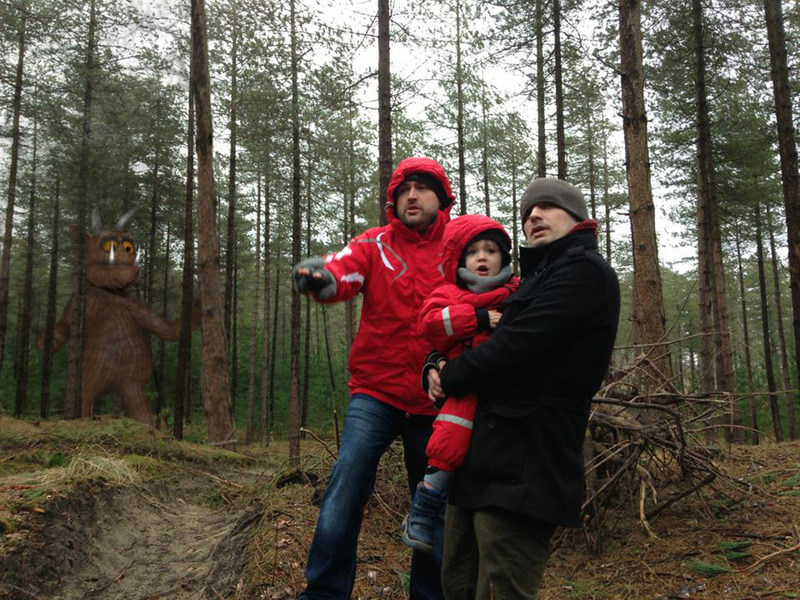 So we told him we were going on a walk and to be on the look out for Gruffalo. At first we had to convince him that the swaying tree in the distance was the result of the great beast stomping through the woods, but in no time at all he was declaring that he could see it for himself! 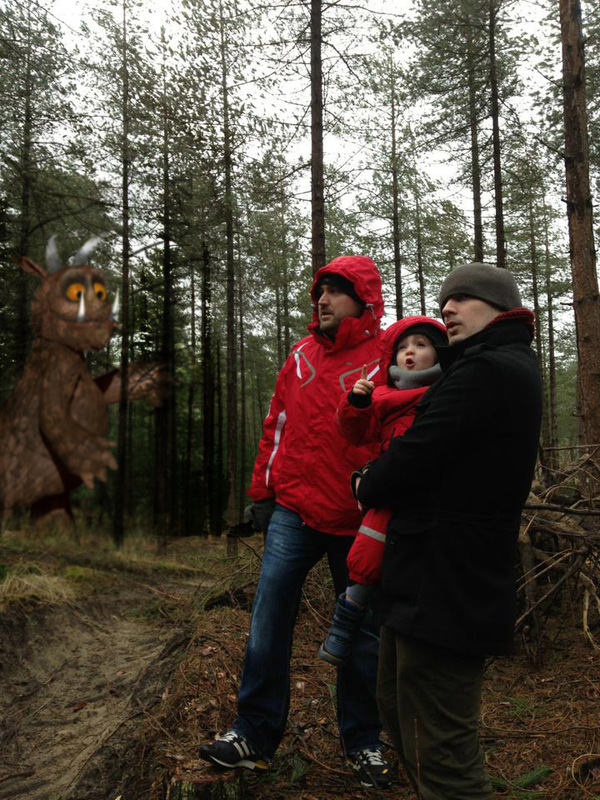 When Janet (his mum) hid behind a tree and screamed at the top of her lungs that the Gruffalo was after her, Rafferty (all of three years old) ran to her rescue, shaking his fists in the general direction of the danger. When we got back home and packed the little man off to bed, I set to work. 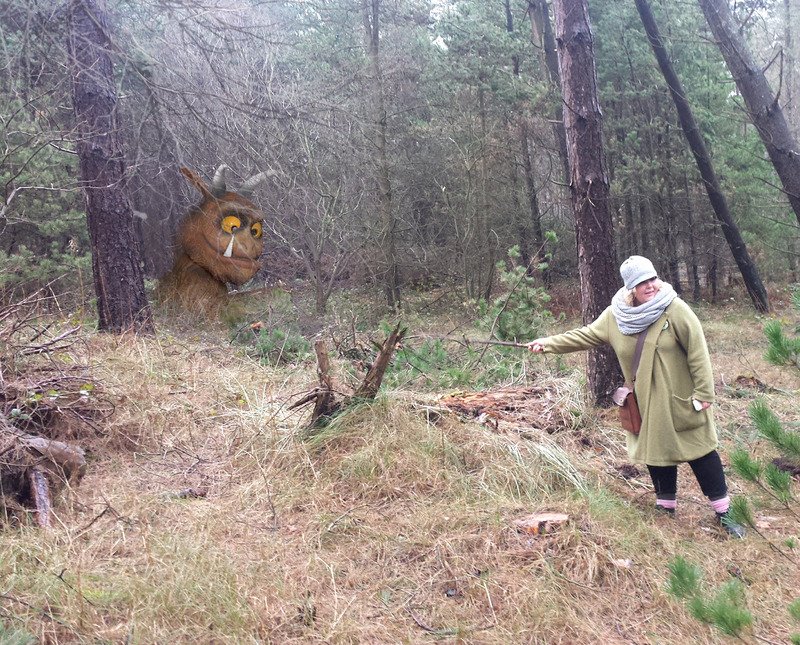 I whipped up a Gruffalo in Zbrush, then shopped him into our dramatic pictures. Not bad for an evenings work. Now we have the fun part of showing Rafferty that his adventure was real!